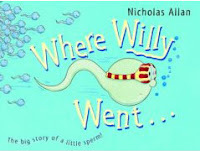 Where Willy Went... by Nicholas Allan. It is, as the cover notes, "the big story of a little sperm". Where Willy went? Where Willy went?! Is that a wise name to be using in this context? I know they were going for alliteration but, come on! 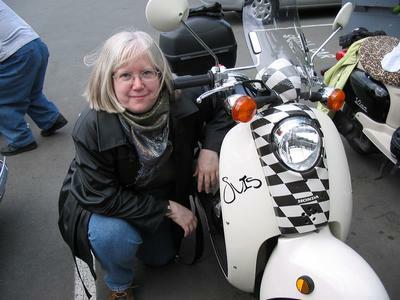 And the poor girl born in our tale, saddled with the name... Edna. I can only presume this name was chosen because of the 99.9% likelyhood that it wouldn't match the name of any young girl reading the book. The name only reminds me of that old recurring sketch on "SCTV", Ted and Edna Boil's Organ Emporium". "Isn't that right, Tex?" "That's right, Edna!" Posted by Doug A Scott at 6:34 p.m.
April 20, 2007 at 10:04 a.m.
Actually is was co-worker Tom who brought this to my attention. As so as I saw it I thought, Doug's disturbing library finds! April 21, 2007 at 9:15 p.m.